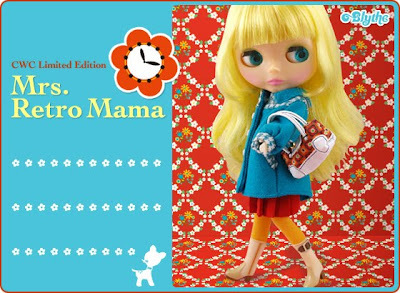 "Mrs. Retro Mama" is the cutest homemaker on the block! Inspired by the vintage Japanese "Showa" Era, her design and fashion reflects that time period. She wears a bright red one-piece with pleats with a retro print apron while she works around the house. She is fashionable everyday, whatever she may be doing! After finishing her housework, she wears a chic peacock blue hounds tooth coat to go shopping with her friend! Her funky printed handbag and white boots are so "Showa" era! Her yellow hair color is pop and cute to remind you of the fun and fashionable 1970's of Japan! 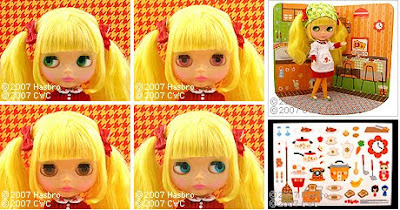 The most interesting detail for this special Blythe is her skin tone! Her skin is made to look like the vintage Blythe dolls from the 1970's! To enrich the experience of the showa world we will be including a showa styled kitchen background. It includes many kitchen items! Her face mold is "Radiance". Her lip shape is the same as "Darling Diva". She has all special eye colors too! Warm pink, Sepia, Turquoise, and Light Green!